A full end-to-end business website that functions both as the administration and internet booking engine. 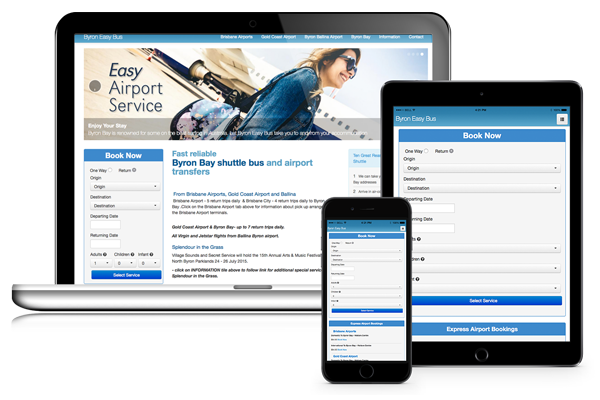 It allows Byron Easy Bus to register and take bookings from Agents and produces details analyis of every aspect of the business. The reporting functions allow Byron Easybus to make qualified decisions about the true nature of their business. Business experience combined with accurate data makes for sound decisions. The site has literally generated millions of dollars in online bookings from the humble beginning of having written everything on a whiteboard or notebook. Of course no site is complete without Natural Logic building in the SEO requirements. The results from the site speak for themselves. We designed the site around solid SEO principles to target the searches that create the most results.